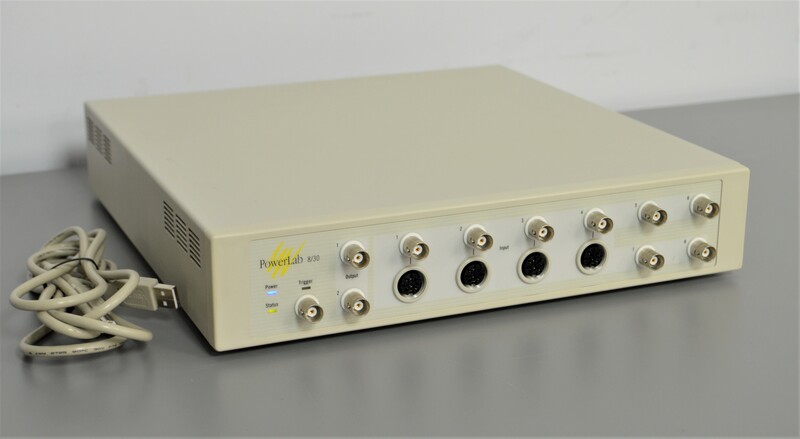 ADInstruments ML870 PowerLab 8/30 Data Acquisition Analysis System . New Life Scientific, Inc. This ADInstruments PowerLab 8/30 is in good cosmetic condition with minor wear and age. This instrument is specifically designed to perform the functions needed for data acquisition, signal conditioning, and preprocessing. It contains its own microprocessor, memory and specialized analog amplifiers for signal conditioning, and it has eight BNC connectors (marked Input 1 - 8) with four alternative pod (DIN) connectors for Inputs 1 - 4, for recording external signals. This PowerLab 8/30 is a great choice for anyone looking for reliable, fairly price data acquisition hardware. Our in-house technician inspected and initialized this PowerLab 8/30, confirming it to pass initialization and diagnostic self-test. No faults were detected with the instrument and no further testing was done. 11.8 x 11.8 x 2.4"